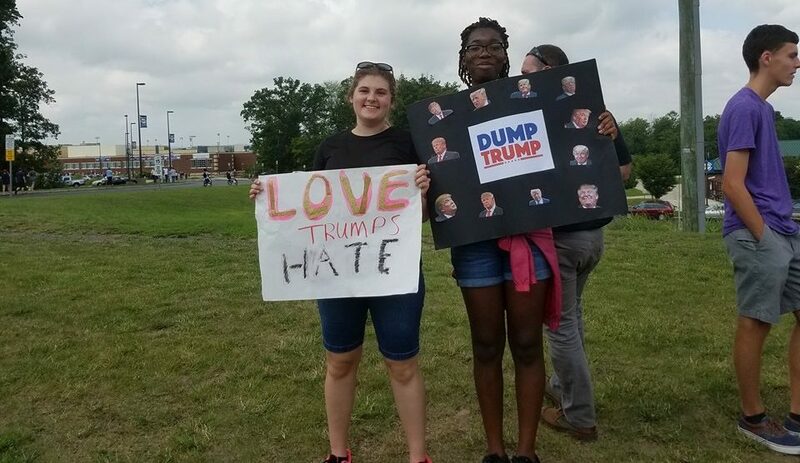 We stood demonstrating outside the Trump rally for less than an hour before someone shouted “Black lives don’t matter!” at my Black friend, and she broke down in tears. 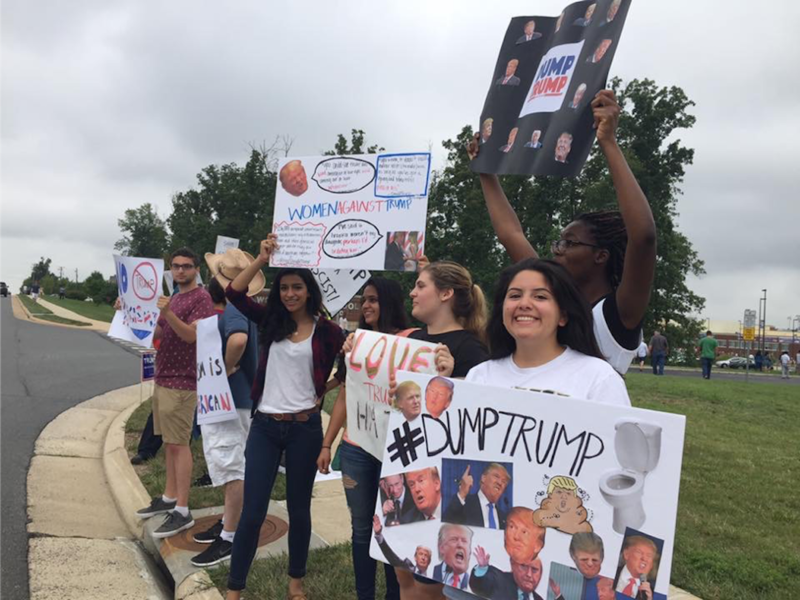 While Donald Trump was busy delivering a speech inside a high school in Ashburn, Virginia – in which he ejected a mother and her crying baby – we were outside protesting. 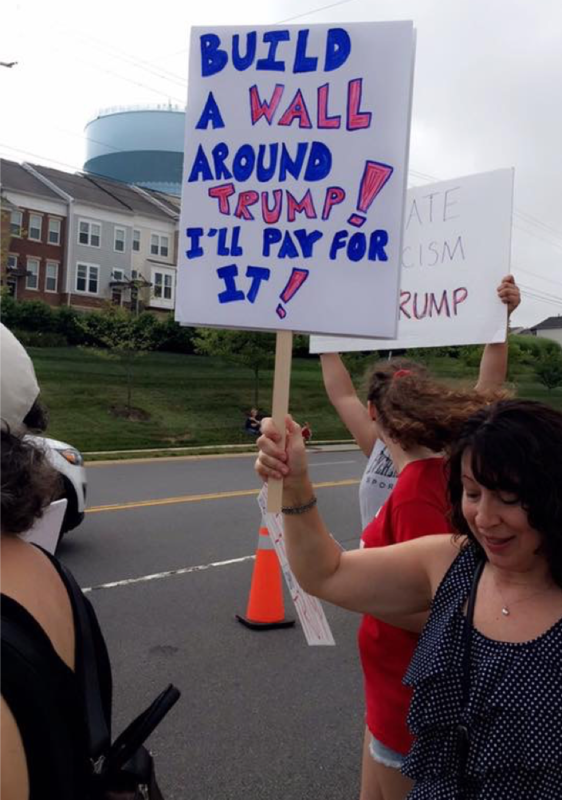 What began as a demonstration organized by the town’s Muslim community in response to the Humayun Khan scandal quickly expanded to include other faiths and political groups, and soon there was a crowd of us gathered to show our opposition to the Republican presidential candidate’s views. Students, adults, and even kids lined up at the front of the school building wearing our anti-Trump t-shirts (“Stump Trump” was the most popular choice), holding up signs, and starting chants. 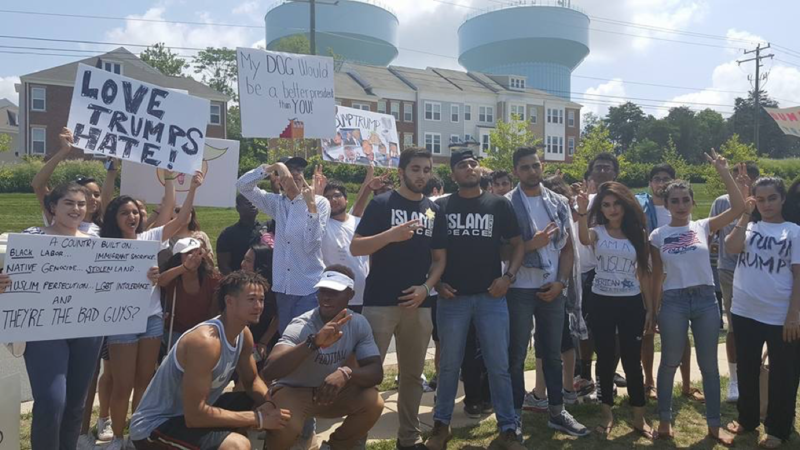 We were all there to show we were against Trump making his way to the White House – to show we were there to stop racism, ignorance, sexism, or stereotyping of religion, instead of encourage it. We agreed beforehand that as Trump supporters began to walk past our demonstration, it was extremely important for us to keep things civil, and be respectful. I made sure to say “hello” and “good morning” to everyone who walked by. Some smiled, others waved their Make America Great Again hats at me. Throughout our time there, our group would get glares and disrespectful remarks. Everyone has seen the videos of how violent Trump rallies can become, and I was anxious to witness it firsthand. I saw one Trump supporter pushing over a guy wearing a Bernie 2016 shirt, which was shortly before someone shouted “Black lives don’t matter” at us. One little girl called us “stupid” as she walked past with her mom. Thousands of people were in line to hear Trump’s speech inside of the school, and the doors closed about a third of a way through them. A group of the protesters who got into inside, silently stood up, linked arms, and faced away from Trump with their backs towards him. They were then escorted out by the police. I felt the best part of this experience was being able to talk to Trump supporters after the rally. Having opposite viewpoints, it was informative to hear what they believe and what they want to happen. No one from either side changed their view, but we felt it was important for us to hear other perspectives. But a few of these arguments and debates were not so calm or mannered. I’m Muslim, and I spent about 20 minutes talking to a guy who truly believes every Muslim is a terrorist. Many of the things he was saying were completely false, but he and the people around him would not even listen to what we said. The KKK doesn’t represent Christianity, I told him, trying to reason with him. “The KKK doesn’t represent Christianity, but ISIS does represent Islam,” he responded. How do you reason with that? It’s scary talking to someone who thinks your religion is a religion of murder, that refugees should not be allowed into the United States, and that the Mexican wall should be built. A majority of the protest group, including myself, were Muslim with non-white skin. Walking around and protesting as a group was a bit intimidating and it came with a lot of cold stares and people stepping back away from us. One of the organizers for the protest, Azeeza Hasan, valued her experience. Wearing a headscarf, she made it clear she was one of the many Muslims at the rally. A friend of mine there protesting, Rafiah Chohan, said after that she felt unwelcome because she wore a hijab. 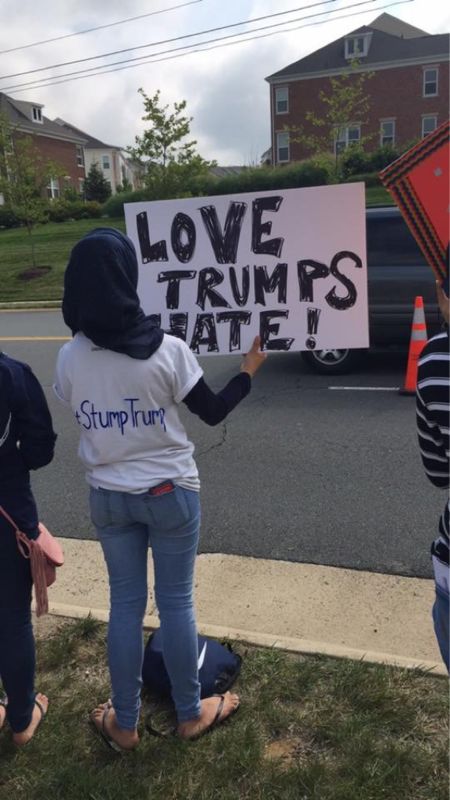 And Mahpara Hassan, who studied at the same high school Trump spoke at, said to me: “It was an interesting experience to see so many people who support Trump at the high school I attended and just recently graduated from, considering that he preaches hate against so many of the minority groups that make Ashburn such an inclusive and loving area. As I left the rally I couldn’t help but think: this is real, this is actually happening. I was well aware Islamophobia existed online, but I had never experienced it in person before. At Trump’s speech, we realized Islamophobia is real and some people are not afraid to be openly racist. It was interesting to see the differences among the supporters with some being friendly and others not so much. 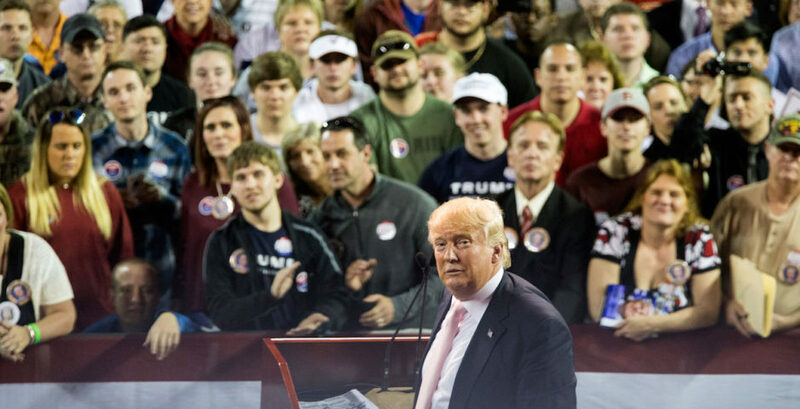 Attending the Trump rally as a protester was exactly what I imagined it to be. I was in fear and shock, but also proud to stick to what I believe against a crowd of thousands. With this experience, I could never change my fear into hate.